18th February 2014. 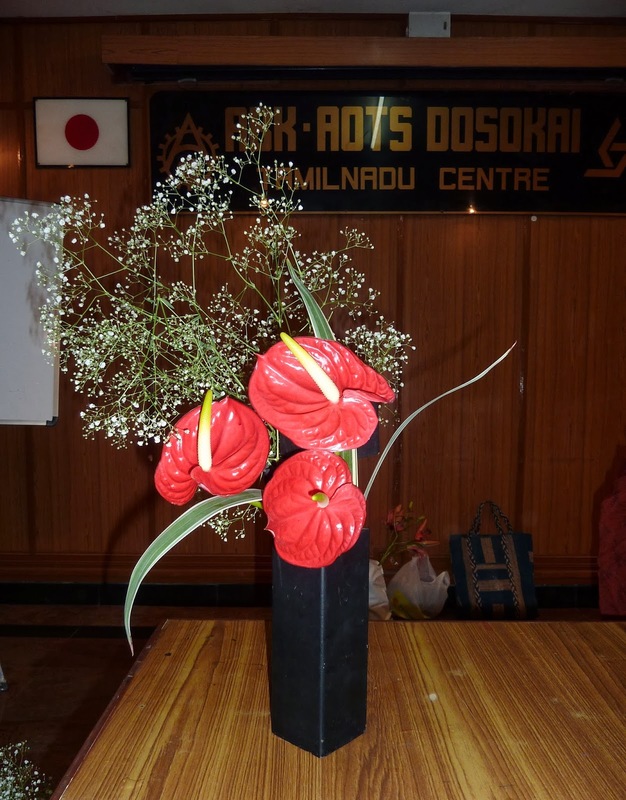 We gathered for our February meeting at ABK AOTS Dosokai where our senior member Sensei Padma Swaminathan took us through two lovely compositions, with her expressions of Valentine's Day. 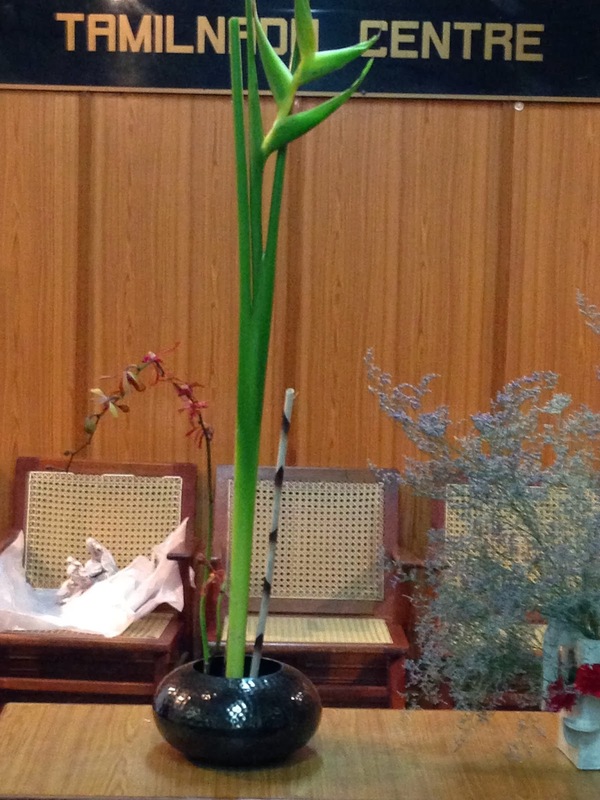 Padma sensei started off with a black Nagiere vase which was a little different with multiple openings at the mouth. 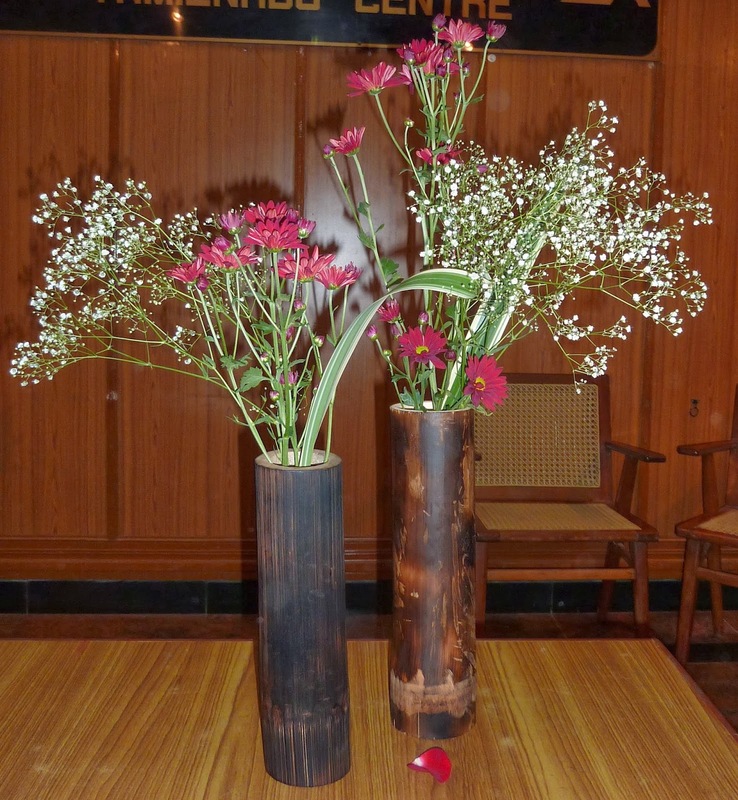 She used anthuriums in a striking rich red along with Baby's Breath. She then moved on to this metal container, from Indonesia, which has little containers inside, all with this same lovely design. Sensei Padma said that there was no need to polish this as it maintained its gleam. 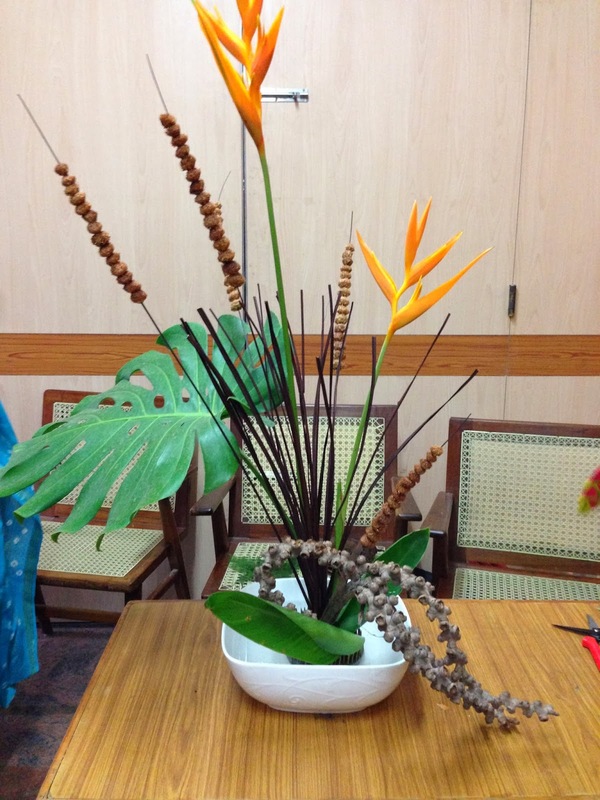 This arrangement with wide palm leaves exemplified the love that she gets from her Ikebana world. The top view highlights the roses which stood for her Ikebana friends, wherever in the world they may be. Truly, "friendship through flowers"! The ladies then looked to create their own expressions of Valentine's Day, and the variety was enjoyable and eye opening. Malathi sensei took the theme of Vrindavan as an age-old expression of love. She explained that for her, the large heart-shaped leaf was Krishna, and the little leaves below the gopikas, attracted by the sound of his flute, which is the bamboo, and there is calebration, romance and love in the air, that the carnations and Baby's breath symbolise. 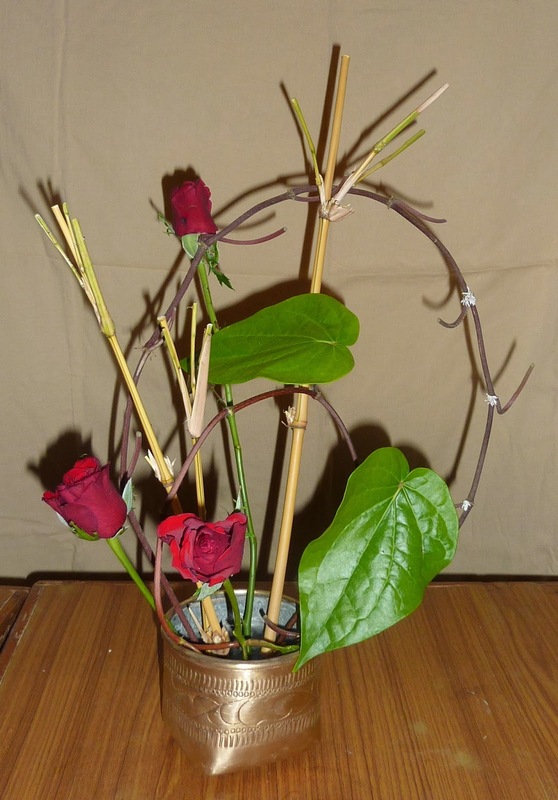 Pushkala used a dry vine to symbolise a heart, and the roses of course stand for true love. Prerana expressed that we all need to learn to love ourselves first of all, and her arrangement is her visualisation of how she has learned to love herself. 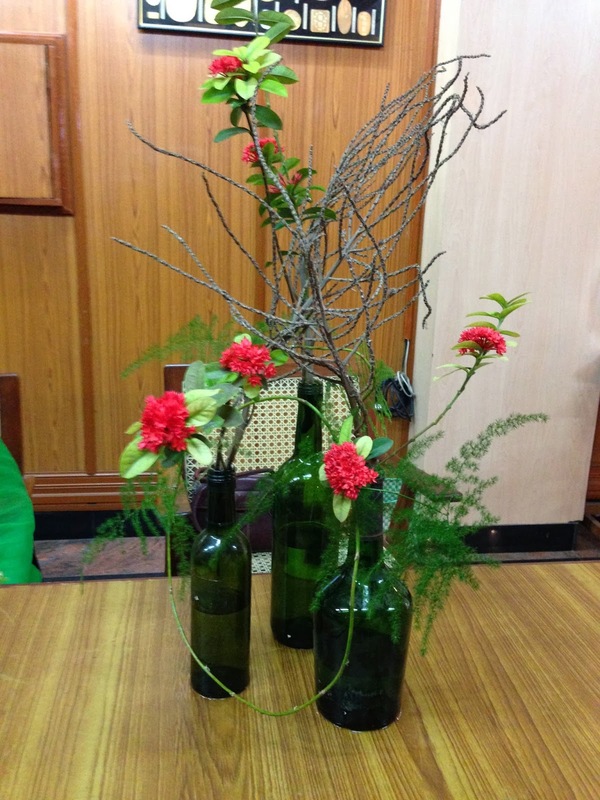 Nirmala used betel leaf vine to create a mood of love encircling her flowers. Chelvi's theme of love was expressed by a pair of vases, forming a harmonic whole. Janaki celebrated the magic of love with a joyous, exuberant display of colour. It was a morning filled with roses and the colour red! To cap a creative session, Padma sensei gave us all valuable tips on preserving the freshness of flowers, bleaching and colouring as well, via handouts, which will be most useful to all of us. We meet in March for our exhibition at ABK and we also welcome Valeria from Auroville, who will be demonstrating. Sixteen members attended our first meeting of the year, which was also our election meeting. The Group condoled the passing away of Mrs. Remani Nambiar, a Sogetsu member from Hyderabad. 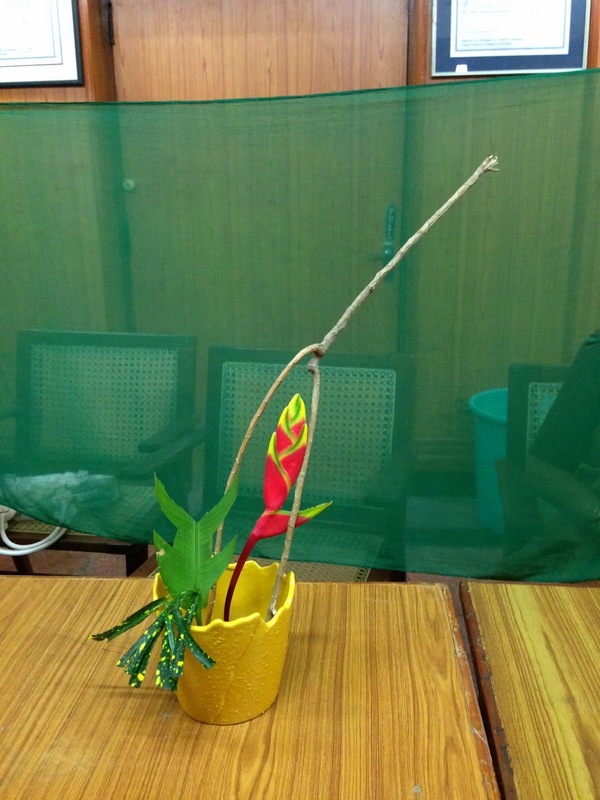 We had the honour of experiencing a demonstration from her in Chennai. in October of 2012.
member whosoever wishes to do so. She then introduced tow of our relatively newer members - Zaitoon and Kalpana. a) ChairPerson: Mrs. Malathi Pandurang. c) Programmes in charge: Mrs. Chitra Thiagarajan. d) Treasurer: Mrs. Prerana Mehta. This was followed by a demonstration by Malathi, and a workshop after that. Malathi sensei's demonstration was a nice way to begin 2014 for the Study Group! She gave us an artist's view on how one can imagine and then express yourself with your material. 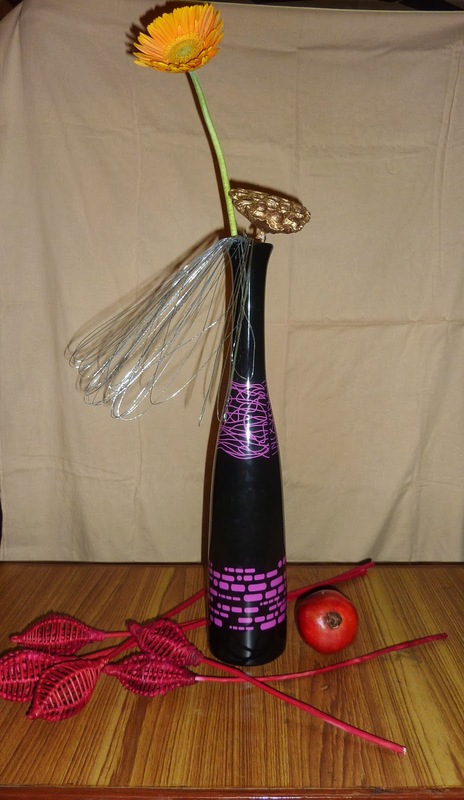 She then also demonstrated how the vase can guide your composition, and different expressions by choice of material. The picture below does not do justice to the first arrangement, which kept the students rivetted as she explained the process of composition. 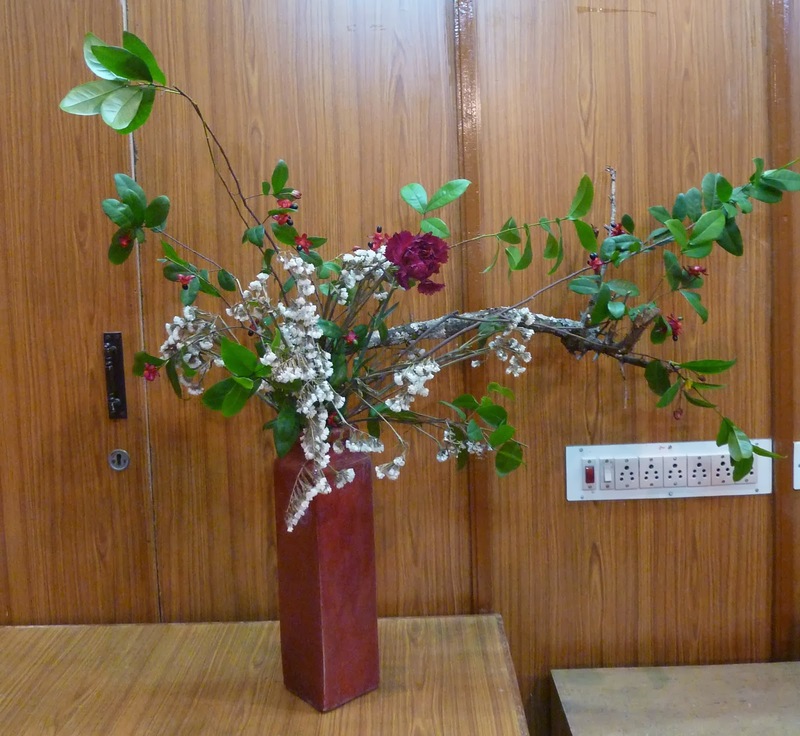 "I used a container, which was like a structure, a combination of shapes, and I recalled Chitra's demonstration of the use of line in architecture and interiors and the relevance to Ikebana. My vase had four facets, like 4 elevations and hence I imagined it to be a house which caught my attention with its unusual shape and I wondered who lives there? Are they friendly, warm, hospitable? 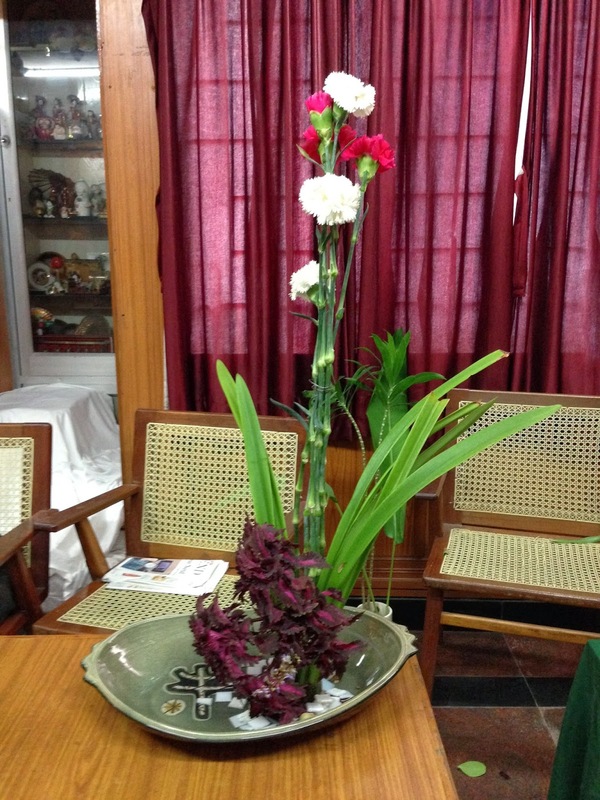 So I approached the house and rang the bell, to my surprise the window opened as well as the door and the two carnations popped out as if asking me 'who's that' and they were really warm and so the red carnations and the interior wall was a lovely green-represented by the leaf. There was wellbeing and joy in the house, which spread like the limoneum, in my imagination. " The members then tried their hand at free expression. 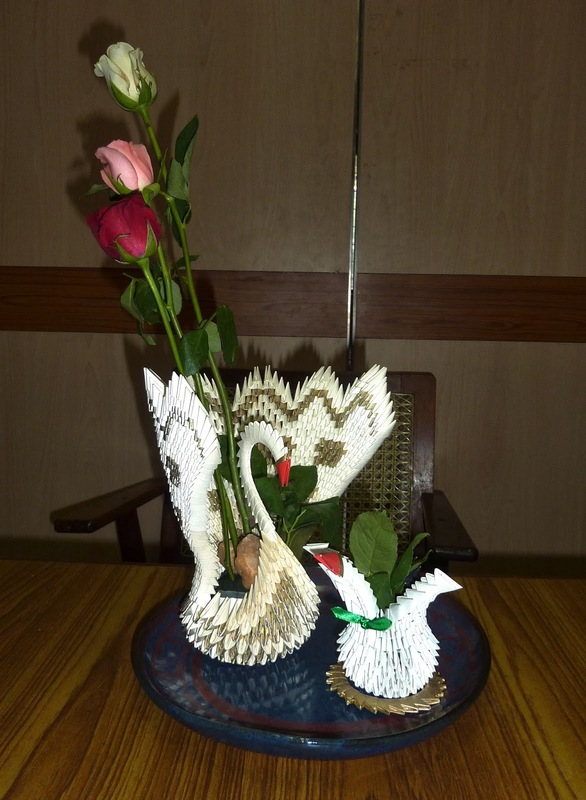 Pushkala made innovative use of the chopsticks she picked up on her visit to China! 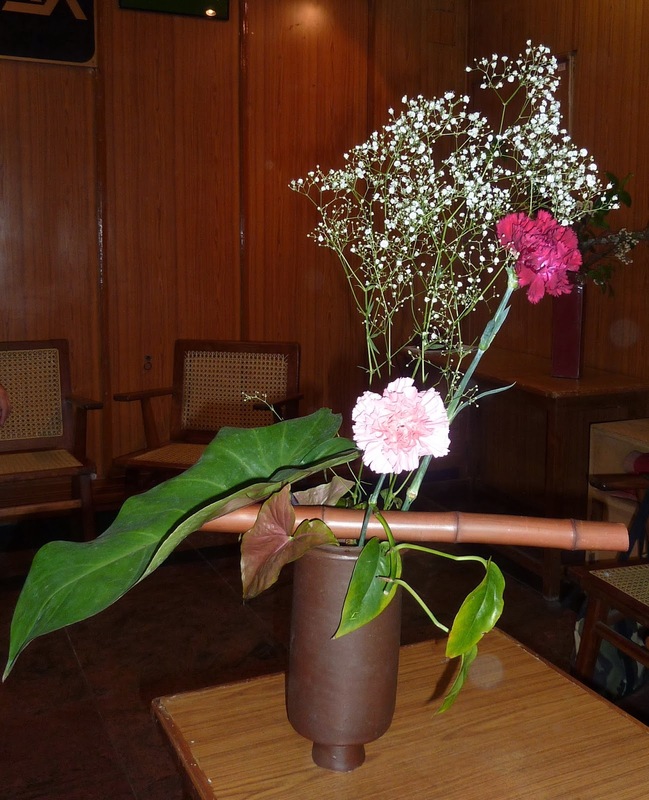 Trishala looked to show the beautiful design on the floor of the vase and omplement it with her arragement, highlighting the brown. We meet again on Feb. 18th at 11am at ABK premises. There will be a demonstration by Mrs. Padma Swaminathan, followed by a workshop, details to be announced later.